Welcome to the Eggomatic factory, a place where chickens have been made redundant and the eggs are now mechanically produced in a factory that looks remarkably like a 5 reel online slot game. Strive to match combinations of eggs to increase your profits and unlock a range of in-game features including free spin bonuses and prize eggs. Eggomatic is available to play at Wizard. NetEnt (short for Net Entertainment) is known not only for their highly anticipated online slots and games, but also for their pioneering attitude towards the industry itself. They lead by example with cutting edge titles such as Butterfly Staxx and Gonzo’s Quest. Be sure to find these top UK slot games created by NetEnt. Joining the NetEnt catalogue of great titles is the rather eggs-tremely poignant title known simply as EggOMatic: a game that is as fun as it is to use egg puns (there will be a couple in this review, we can only apologize now). This game is so addictive that it’s quite confusing to think about. You’ll often question why you are playing this 5x3 slot with 20 pay-lines/10 betting levels. There are lots to see and do in this game despite you may be turning away from the game on name or face value. We highly recommend you give it a chance for this is a game worth your time and your attention. All it needs is a chance to crack that demeanour. 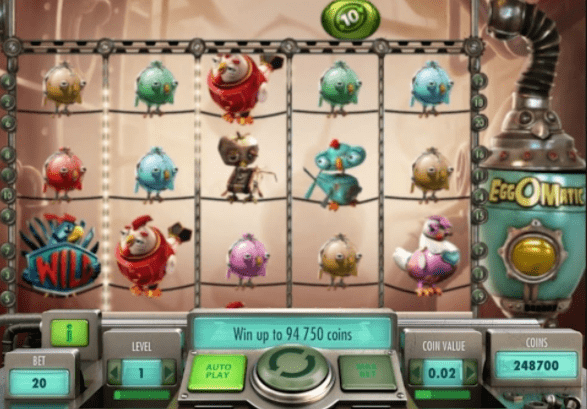 Do you think this Eggomatic made it to top 20 UK slot games? The game begins with a short video detailing the story of EggOMatic. The basic premise is based on a rooster who invents the machine called the EggOMatic to make more eggs. It’s your job in the game to help this friendly rooster in making as many eggs as possible. He’s quite a rich animal for having no pockets as he’ll be giving you cash in hand for a job well done depending on the number of eggs matched. The design leans very heavily on machinery which works very well for this type of game. It’s definitely immersive and you’ll never stop wanting to please the rooster (he’s quite hard to please so the more you play the more chances at higher rewards). Higher-value symbols in EggOMatic take the shape of various robotic chickens. They are, from highest to lowest value, a white and red rooster with a crown tail, a lavender hen with a heart on her chest, a green and white young chicken with huge eyes, a blue rooster with a red comb and propeller-shaped tail, and a rather sad little chicken who happens to be brown. Lower-value symbols also appear in the form of much smaller chickens at different colours again. The soundtrack of the game is very reminiscent of what it would be like to work in a factory. Heavy machinery noises play in the background, we know it can be loud but there are eggs to be made! There is also a mute button if you want to rest your ears. The wild will also cluck whenever matched so be sure to be prepared for that, we nearly laid an egg out of fright when it happened the first time to us! For more Wizard Slots promotions click here. An equally awe-inspiring game is the White Wizard slot.